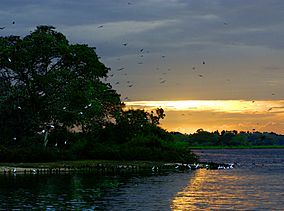 Bundala National Park is a protected national park in the south east of Sri Lanka. The area of 6216 hectares was first protected in 1969. It is an important wetland and was added to the list of Ramsar sites in 1990. There are many animal species living in the park including elephants and turtles. Because of the wetalnds there are many species of bird which come to the park, including flamingos, pelicans, and storks. Bundala National Park Facts for Kids. Kiddle Encyclopedia.